… Ida Mary Greaves, graduate of Newcastle Hospital and Matron of the Australian Voluntary Hospital in France, attended an investiture at Buckingham Palace. Pages of Anzac Memorial Book 1917 in the collection of Newcastle Public Library. Click on image to enlarge. She and Sydney woman Nora Fletcher who was the Matron of Red Cross hospitals in France were the first Australian women to be awarded the Royal Red Cross 1st Class during the Great War. According to the Australian War Memorial database of honours and awards only 44 Australian women received this honour during that conflict. A search of contemporary newspapers on Trove indicates that Matron Greaves’ fame was not confined to her home town. 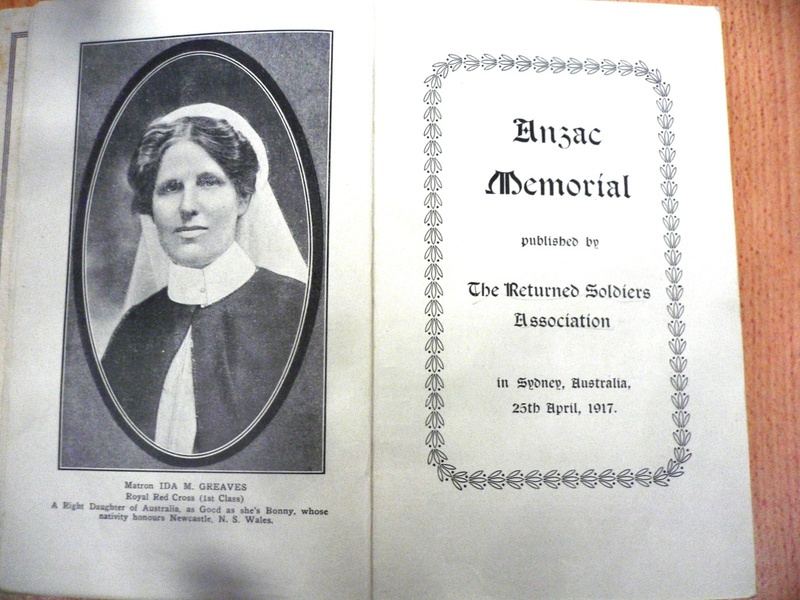 In 1917 the Returned Services Association featured Ida on the frontispiece of its Anzac Memorial publication. This entry was posted in Uncategorized on 12/07/2015 by Great War Nurses from Newcastle & the Hunter Region.